For the first time since the end of August and following a two-loss road trip, No. 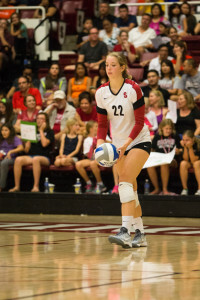 8 Stanford women’s volleyball team (6-2) returned to The Farm this past weekend. It was just what the doctor ordered, as the team continued its stretch of dominance at Maples Pavilion with three-set victories over No. 24 Pacific and St. Mary’s. With the two wins, the squad’s home winning streak extends to 27 matches. Friday’s matchup against Pacific (9-2) was tougher than the three-set score (25-22, 25-18, 25-20) might suggest. The teams were never separated by more than three points in the first set, and there were 12 tie scores and six lead changes in the second set. But the Cardinal distanced themselves from the Tigers at the end of both sets – a 5-1 run at the end of the first and a 6-1 run at the end of the second – en route to the sweep. Stanford hit .322 for the match and were led on offense by freshman opposite hitter Hayley Hodson’s 14 kills on 27 total attacks. The team held Pacific to a .144 hitting percentage, spurred by 13 team blocks – six from junior Ivana Vanjak, who has somewhat unexpectedly emerged as the team’s second option at middle blocker behind her classmate junior Merete Lutz. The Cardinal’s non-conference finale on Saturday evening was much more of a breeze. 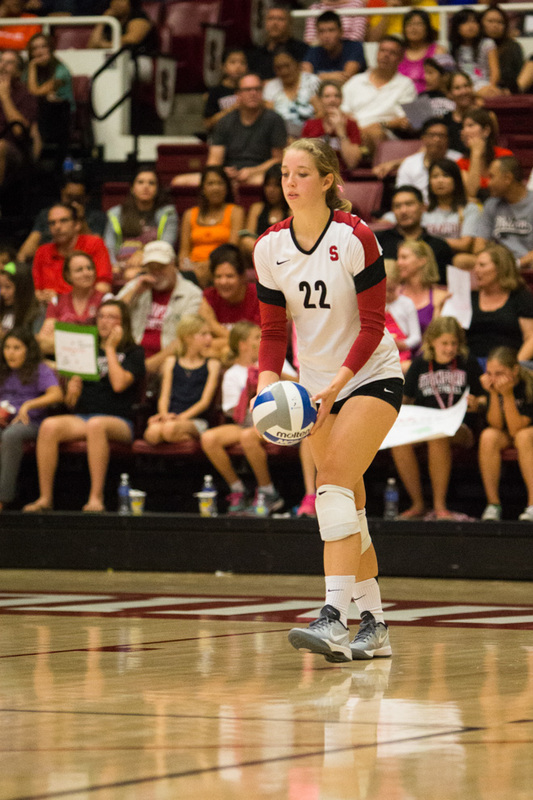 Behind a season-high 11 service aces, Stanford swept St. Mary’s (5-5): 25-14, 25-16, 25-14. Bugg led the team with four aces in the match – one fewer than her total over Stanford’s first seven matches of the season – and now has a team-best nine aces on the season. Hodson added three aces against St. Mary’s as well. Overall, Stanford hit .292 in the match while holding the Gaels to .042 hitting. Lutz had a team-high 10 kills on 16 total attacks, for a .375 hitting percentage. Fourteen Cardinal players saw game action on Saturday – everyone on the roster except senior Inky Ajanaku, who is out for the season, and freshman middle blocker Courtney Bowen. The Cardinal now enter conference play with a bit of momentum after what has otherwise been one of the more difficult non-conference seasons in recent memory. Major adjustments had to be made to the team’s offense after the injury to Ajanaku, and freshmen have been forced to take big roles early on in their careers. All of this led to the team’s first pair of consecutive losses since 2013. Still, Stanford played one of the toughest non-conference slates in the nation, taking on three ranked teams including No. 1 Penn State and then-No. 6 Illinois. This week, the tide turns to conference play, as the Cardinal will open up against Cal as has become customary. The Bears enter with a 6-5 record, counting five-set victories over UNLV and Harvard among their early season highlights but losses to Green Bay and Air Force among their lowlights. 2014 All-American Honorable Mention senior middle blocker Lillian Schonewise is one player to watch out for on Tuesday night, as she leads Cal with 2.66 kills per set and a .346 hitting percentage. It’s the start of a tough week for the Cardinal, who will host No. 3 USC on Sunday afternoon at Maples Pavilion after the Cal matchup. The Trojans were the last visiting team to win at Maples Pavilion back on October 30, 2013. Stanford remains confident however, and a bit of momentum at the end of non-conference play will ease the transition into the stronger competition of the Pac-12. First serve for the first Big Spike of the season is set for Tuesday at 7 p.m. at Haas Pavilion in Berkeley. The match will be televised on Pac-12 Network Bay Area.